Sarah Biss knew little about Saturday’s Navy-Air Force Half Marathon before embarking on a vacation to the United States. She certainly didn’t plan on winning the race. But that’s just what Biss, 36, did, taking the women’s half marathon title in 1:23:18 Saturday. The New Zealander is simply visiting America on a six-week vacation—she leaves Thursday—and stumbled upon this weekend’s event. The 2:39 marathoner and one-time New Zealand national team runner didn’t know what to expect in terms of competition, so winning came as a shock to her. “I don’t have a clue about the D.C. running scene,” she said with a chuckle. Biss beat out a field of more than 1,200 for the crown, including second-place Tracy Spiess of Fairfax, who finished more than three minutes behind the Kiwi. The 34-year-old Spiess, who finished in 1:26:31, was using Saturday’s half marathon as training for next month’s Marine Corps Marathon. There, she hopes to break the three-hour mark. She described herself as “falling into running” having not ran completely until recently. The 13.1-mile course started on 15th Street down Independance toward the Arlington Memorial Bridge before turning north for an out-and-back on the Rock Creek Parkway and finishing with a loop around Hans Point. The route was in reverse of last year, starting with the Rock Creek out-and-back and ending with the Hans Point loop. That course, however, put the leading half marathoners right in the back of the five mile walkers, causing some to opt for the grass alongside the road, rather than navigating the crowd. Shannon Miller won last year’s inaugural race for the women in 1:21:39. Alexandria’s Patrick Fernandez – who like Spiess was using Saturday’s half marathon as training for October’s Marine Corps Marathon – took the men’s race in 1:07:52. The mark bested last year’s time of 1:10:11 set by David Burnham, who won the inaugural event. Fernandez, 26, had won the sister event – the Navy 5 Miler – the previous two years and even held the race record there before jumping into the half marathon field. “My coach just recommended this half marathon because it’s a nice flat course,” the Capital Area Runners athlete said. Fernandez said he ran with a pack of runners till about the 4- or 5-mile mark at which time he picked up the pace and created some distance between himself and the pack. Matthew Barresi of Falls Church finished second to Fernandez in 1:08:16. Evan Jukovich of Washington came in third at 1:10:00. 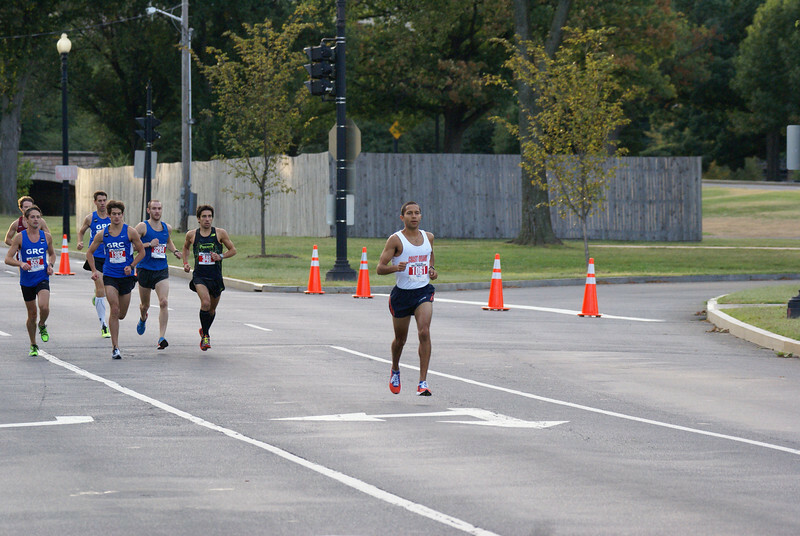 Fernandez’s Navy 5 Miler event record of 25:13 stood for only a year before Washington’s Mike Franklin of the Georgetown Running Club used the flat course and mid-50 temperatures at the start to best that mark, running a 24:52. Franklin ran with a pack of teammates before breaking away about a half mile from the finish. Despite running an event record, Franklin said he was “not unhappy” with the result and hopes to run faster 5-mile races in the future. The 22-year-old, who plans on running the Wilson Bridge Half Marathon and the Army 10 Miler in October, just graduated from Princeton University earlier this year. also bested the old event record. Sam Luff of Washington came in third at 25:28, though Kieran O’ Connor ran faster — 25:14 — despite fighting his way through the crowds when the race inexplicably started 10 minutes earlier than advertised. Though Hilary May also ran an event record in the five mile (30:12), she was left worried on the starting in when she couldn’t find her teammate, Maura Carroll, who also fell victim to the change in start time. The previous event record was 30:39 set in 2008 by Martha Merz. Race organizers later said there was confusion regarding the previous posted start of 8:10 a.m. was at one point moved up to 8 a.m. with little notification. The race website lists 8:10 a.m. as the start despite the earlier gun. Second place finisher Lauren Carter traveled from New York City for the five mile as training for the Boston Half Marathon on Oct. 13. Carter finished in 30:39, but looks to return to D.C. next April for the Cherry Blossom 10 Miler. Kelly Swain, 28, of Arlington finished third in 31:13. While the Navy 5 Miler has been around since 2005, Saturday’s event was just the second running of the Navy-Air Force Half Marathon, and provides an alternative distance to the popular, local races of the Marine Corps Marathon and the Army 10 Miler. “It’s a great way to celebrate the joint cooperation between the services too,” Anthony Calandra, commander of the Joint Base Anacostia-Bolling, which manages the event. The half marathon started with 3,200 entrants in the first running last year and had nearly 5,000 this year. Proceeds from the event go to moral and wellness programs for military members and their families.